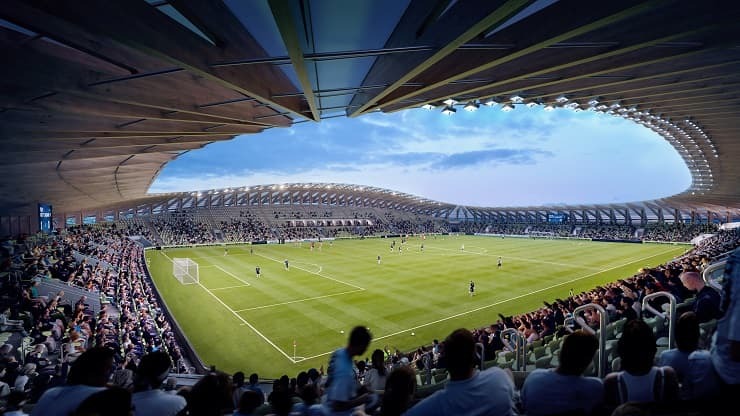 London-based firm Zaha Hadid Architects has been commissioned to build the world’s first wooden football stadium. 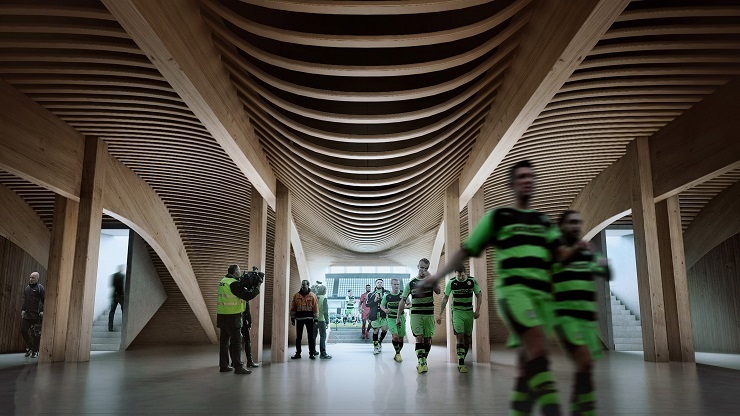 The 5,000-seat stadium will be built entirely from wood for the British football club Forest Green Rovers. The all-wood football stadium is a part of British soccer club FOREST GREEN ROVERS’s Eco Park development. Zaha Hadid Architects won seeing competition from over 50 entrants from Europe and America. The world’s first wooden football stadium will be constructed entirely from wood and powered by sustainable energy sources. One of the biggest reasons why wood is a more popular choice these days is because it’s sustainable, renewable and environment-friendly. In fact, wood-framed structures enable easy modifications because of its ease, versatility, and cost-effectiveness. Wood is carbon neutral, thus wooden structures can absorb and store atmospheric CO2. Around 0.8 tonnes of carbon emissions are absorbed by every cubic meter of wood used in construction. For example, if a structure uses 20 cubic meters of wood, it’s saving 16 tonnes in carbon emissions. For reference, 16 tonnes of carbon is emitted by driving 100,000 kilometers. Wood-framed structures can have a positive impact on climate change. Moreover, it’s a healthy choice over other materials. The world’s first wooden football stadium will feature an undulating bowl made from timber. Each of the 5,000 seats will be positioned such that it gives spectators unrestrained views of the pitch. On top of that, the stadium will be powered entirely by sustainable energy sources. The proposed Eco Park might also include a nature reserve and a public transport hub. There are also talks of the restoration of Stroudwater canal in Gloucestershire, which links England with Wales. The project is commissioned by renewable energy company Ecotricity, which aims to build an Eco Park that is either carbon neutral or negative, generating its own energy source. The wooden stadium, training pitches, and a sports science hub will make up one-half of the Eco Park. Meanwhile, the other half will operate as a green technology business park. Zaha Hadid Architects was awarded the contract on the merit of its previous work. UK’s most prestigious firm has also designed the London Aquatics for London 2012 Olympics. Currently, it is building one of the five stadiums that will host the 2022 FIFA world cup in Qatar. The London-based firm choose to continue its practice after the passing of its late figurehead and founder, Zaha Hadid. "Zaha is in the DNA of Zaha Hadid Architects. She continues to drive and inspire us every day, and we work on as Zaha taught us – with curiosity, integrity, passion and determination," said a statement issued by the firm. 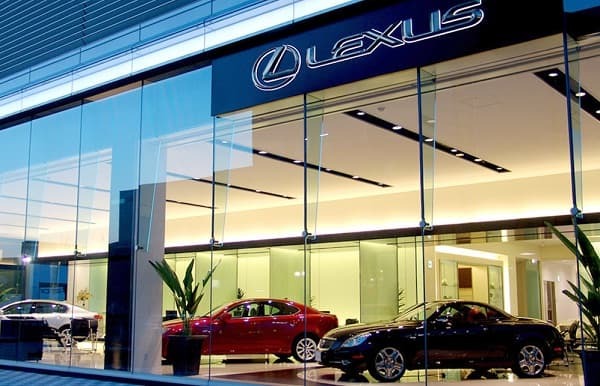 Toyota to expand with production of Lexus in U.S.